The Zionist Organization of America (ZOA) has condemned the European Union (EU) for issuing new racist directives this week that state that any Israeli entity that wishes to apply for a “grant, prize or financial instrument” from the EU must first submit a declaration stating that it has no direct or indirect links with Judea, Samaria, Gaza, eastern Jerusalem and the Golan Heights. (All these territories were captured by Israel in a defensive war following Arab assault in the 1967 Six Day War. Other than the Golan Heights, all territories coming under Israeli control belonged to no other sovereign power and in fact had been previously illegally occupied by Egypt and Jordan). The EU has instituted this policy on the basis of its false contention that Jewish communities in Judea and Samaria are illegal under international law. This EU policy is based on a politicized misreading of Article 49 of the Fourth Geneva Convention, which prohibits “Individual or mass forcible transfers, as well as deportations of protected persons from occupied territory to the territory of the Occupying Power or to that of any other country, occupied or not” and also deportation and transfer of its own civilian population into occupied territory. Yet, as the ZOA has pointed out in a Jerusalem Post op-ed earlier this year, Palestinians are not being deported or forcibly transferred from the territories, nor are Jews being deported or transferred from Israel to the territories; they are moving there freely of their own will. Moreover, the Fourth Geneva Convention deals only with territories belonging to a sovereign power, whereas Judea and Samaria illegally seized by Jordan in 1948 and captured by Israel following Jordanian attack in 1967. Upon its recapture by Israel in a defensive war, Judea and Samaria were restored to their legal status as areas designated for the Jewish homeland and Jewish settlement under international law. The EU directives, due to be released publicly on Friday, have been strongly criticized by Israeli Prime Minister Benjamin Netanyahu, who has said that Israel rejects dictates regarding its borders from any external body, saying that , “As prime minister, I won’t allow hundreds of thousands of Israelis living in the West Bank, Golan Heights, and in Jerusalem — our united capital — to be harmed. I expect those who really want peace and regional stability to deal with this matter after they solve more pressing problems in the region like the Syrian civil war and Iran’s race to get a nuclear weapon. We will not accept any foreign dictates about our borders. This matter will only be determined through direct negotiation between the [two] sides” (‘To work with EU, Israelis must prove no links to “territories,”’ Times of Israel, July 17, 2013). 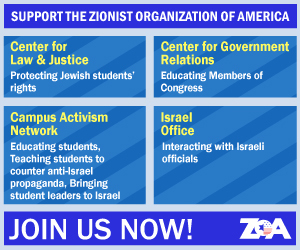 ZOA National President Morton A. Klein said, “The ZOA is appalled by, and repudiates the repugnant proposition, that people cannot live and build homes and communities in Judea and Samaria if they happen to be Jews. Such a policy is obviously racist and discriminatory and it is past time that it was described as such. “The EU takes no similar action on other major territorial disputes. It does not boycott China over its genuinely illegal occupation of Tibet, or India for controlling a part of disputed Kashmir. It has not boycotted Turkish individuals and organizations operating out of the part of Cyprus illegally seized by Turkey in 1974. The EU’s position on Jews in Judea and Samaria is purely and cynically political. “By producing this directive, the EU has done immeasurable harm to the cause of peace that it professes to champion. Why would Mahmoud Abbas’ PA fulfill its signed commitments under the Oslo agreements to dismantle terrorist groups and fight terrorism, end incitement to hatred and murder within the PA, and negotiate faithfully with Israel without resort to international forums if the EU simply adopts the racist and discriminatory Palestinian position of demanding a Jew-free Palestinian state in Judea and Samaria and seeks to penalize Israel? Why would the PA do anything towards peace when its anti-peace policies are actually supported by the EU and Israel penalized, rather than the PA? “This directive exposes the EU’s disgraceful cynicism, hypocrisy and lack of moral fiber. The EU will not label Jew-killing terrorist like Hizballah a terrorist group. 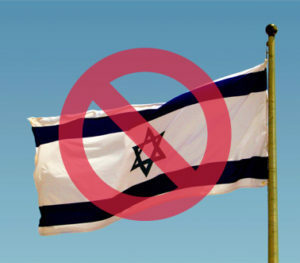 But it shuns and penalizes people living in Judea and Samaria if they happen to be Jews. “The EU’s conduct is likely to inflame anti-Semitism and encourage movements that seek to isolate and harm Israel, like the Boycott, Sanctions, Divestment (BDS) movement.